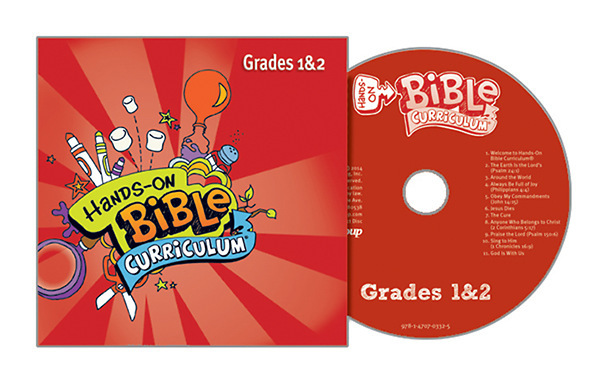 Need more than one CD for your Hands-On Bible Curriculum® classes? This additional CD has the same great music and sound effects as the one included in the quarterly Learning Lab®. Get an extra copy for additional class times or just have an emergency copy on hand if needed. Teach as Jesus taught. Use captivating gizmos to bring kids closer to God! What if Jesus taught your kids? How would he do it? What tools would he use? What would he want them to learn and remember? The Bible gives us lots of examples of how Jesus did it 2,000 years ago. He used everyday objects like coins, fish, and plants to help people remember the truths he shared with them. Hands-On Bible Curriculum® does the same thing. We call them “gizmos,” and they serve the same purpose: to help kids understand important Bible truths. It worked for Jesus, and it still works today. It’s guaranteed to work. Time after time, kids are able to remember what they learned weeks, months, and even years later. Since they experience what they’re learning, it sticks longer. Hands-On Bible Curriculum received the top award for customer satisfaction for Sunday school materials. * It’s helped millions of kids in thousands of churches grow closer to Jesus. Hands-On Bible Curriculum was also voted “easiest to teach” in a national poll of children’s ministry leaders. With step-by-step teacher guides, gizmo-packed Learning Labs, music, and lots of extras, it helps your volunteers make the greatest impact with the least amount of work.